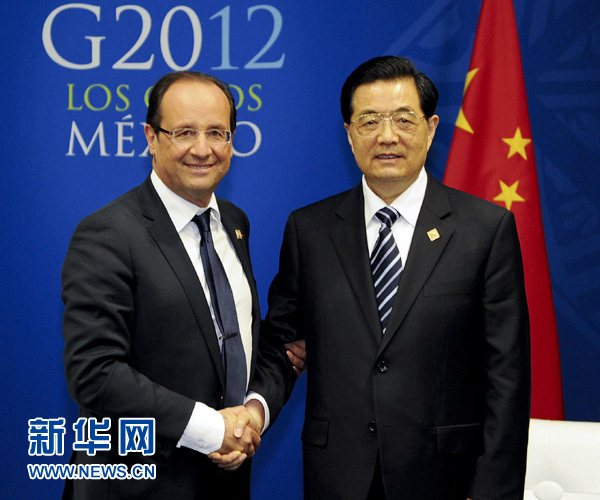 Chinese President Hu Jintao and French President Francois Hollande met in Los Cabos Monday on the sidelines of the G20 summit, agreeing to continue to advance the all-round strategic partnership between their two countries. Hu expressed appreciation of Hollande's repeated statement on attaching importance to China-France relations and wishing to strengthen all-round cooperation. The Chinese president said his country is ready to work with France to advance their all-round strategic partnership to a new stage so as to bring benefit to the two peoples and promote peace, stability and development of the world as a whole. Noting that France was the first major Western country that established diplomatic relations with new China, Hu said China-France relations have long been in the leading position in China's relations with Western countries over the past 48 years. He said under the complex and ever changing situation, China and France shoulder important responsibilities as permanent members of the UN Security Council and major economies in the world. Hu put forward a four-point proposal on expanding China-French relations, urging the two countries to adopt a strategic and long-term perspective on bilateral ties by maintaining high-level contacts and deepening strategic mutual trust, and to reinforce traditional cooperation in nuclear energy and airplane manufacturing while advancing cooperation on new energy and high technology. He called on the two sides to expand reciprocal investment so as to promote balanced growth of bilateral trade. The two countries should strengthen cultural and people-to-people exchanges by encouraging communications between their youths and local governments, Hu said. They should also strengthen communication and coordination on major regional and international issues, he added. Hollande, who became French president last month, said the new French government will firmly work on expanding the all-round strategic partnership between France and China. As both France and China advocate multi-polarization of the world, they share the same views on a lot of major issues, he said, adding that France places great importance on its relations with China and is ready to join hands with the Asian country to address various global challenges and safeguard world peace and stability. Hollande expressed the wish to strengthen strategic dialogue with the Chinese side and expand cooperation on trade, investment, energy an aviation, and readiness to promote cultural exchanges and maintain communication and coordination with China on major regional and international issues. France will continue to make active efforts to advance Europe-China relations, he pledged.